Transglutaminases are defined as R-glutaminyl-peptide: amine γ-glutamyltransferase (EC 2.3.2.13). 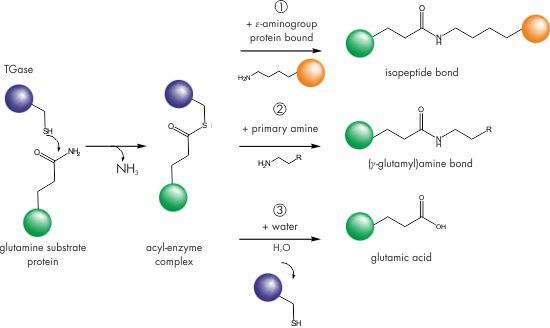 They use a modified double-displacement mechanism to carry out an acyl transfer reaction between the γ-carboxamide group of a peptide-bound glutamine residue and the ε-amino group of a peptide-bound lysine. The active site consists of a catalytic triad (Cys, His and Asp). The active site cysteine reacts with the γ-carbox-amide of the glutamine, forming a γ-glutamyl thioester releasing ammonia. This activated species subsequently reacts with nucleophilic primary amines, yielding either an isopeptide bond (pathway 1) or a (γ-glutamyl)amine bond (pathway 2). When an amine is not available, the acyl-enzyme intermediate reacts with water to yield glutamic acid (pathway 3). The incorporation of dansylcadaverine into casein (compare to pathway 2) leads to an increase in fluorescence intensity. The principle is used in kit T036. During the transpeptidation reaction ammonia (NH3) is released. The amount of ammonia can be monitored using glutamate dehydrogenase and NADPH as co-factor. Dependent on the transglutaminase either casein or synthetic peptides serve as acyl donor substrates. The reaction can be monitored online using a UV photometer at 340 nm. An activity assays using this principle is available for MTG (M001). The kit M003 is most sensitive allowing detection of TG2 in the picogram range using the incorporation of biotinylated peptides to microtiter plates displaying primary amines on the surface. T055 is less sensitve but more specific for TG2. After enzymatic incorporation of the biotinylated peptide, biotin is subsequently detected using streptavidin / peroxidase conjugates. The kit E018 is dedicated to determine the overall quantity of TG2. The principle behind is a sandwich EIA based on two monoclonal antibodies against tissue transglutaminase (TG2). The kit provides coated plates and all reagents necessary including a tissue transglutaminase calibrator. The chromogenic assay kit Z009 uses Z-Gln-Gly as the amine acceptor substrate and hydroxylamine as amine donor. In the presence of transglutaminase, hydoxylamine is incorporated forming glutamyl-hxdroxamate which develops a colored complex with iron (III) detectable at 525 nm (red). The reverse reaction of TGs is measured in the isopeptidase assays F001 and F002.